Single domain protein. Unfortunately, the most interesting region (differing from the template) is conformationally flexible in the middle (green in the image above) of this NMR structure, and some residues from it were removed from NMR models for evaluation of predictions. An unusual helix-turn-helix (HTH) containing protein. The last two α-helices (yellow and orange-red) form the HTH motif, which is readily recognizable by almost perpendicular orientation of the two helices and a long extended "turn" between them that positions the N-terminus of the second helix close to the middle of the first helix. 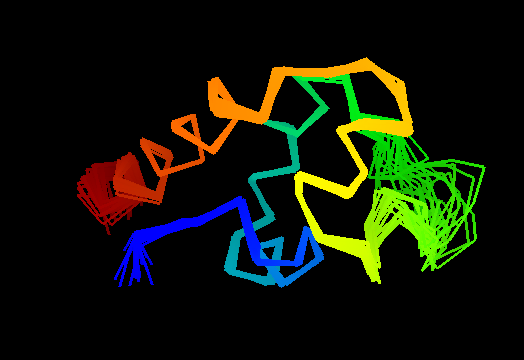 The rest of the structure is unique and shared only with the closest homologs: T0469 and the only full-chain template 2fi0. This N-terminal segment is structured as 3 helices and completes the HTH core in a manner similar to how a single N-terminal helix packs agaist HTH in a classic three-helical bundle fold. We used COMPASS to find homologs of T0473. The first COMPASS hit in the SCOP database is to a typical HTH three-helical bundle. Reasonably small E-value of ~0.03 is almost good enough to validate this match. Comparative modeling: medium. Closest template detectable by HHpred, but contains some structural differences. The only full-length template was 2fi0, which is another structure of a hypothetical protein determined by a structural genomics center. Both molecules are shown below with the most similar HTH region (yellow-red) at the back and more variable N-terminal helices in front. The first two helices (blue-cyan and cyan-green) have very similar orientations in both molecules, however, the differences are pronounced in the green-yellow region, where T0473 has a 6-residue deletion eliminating the fourth helix of 2fi0. Another interesting difference is that 2fi0 contains a C-terminal segment (red) that forms β-strand pairing with the N-terminial segment (blue). Thus a two-stranded β-sheet is present in 2fi0. However, T0473 lacks the C-terminal extension. Nevertheless, the N-terminal region (blue) still holds the extended conformation even without H-bond pairing, at least close to the first helix. NMR models contain two C-terminal residues 69-LE-70, not present in the target sequence (coming from His-tag). COG2846 in COG database, which is predicted to be "Regulator of cell morphogenesis and NO signaling". Below is PROMALS3D alignment of several most distant homologs detectable by PSI-BLAST. This alignment was not edited manually and may have errors. Curiously, many sequences of this family contain conserved Cysteine residues in the most varible region of the molecule, and some also contain Histidine in the HTH turn. These residues are highlighted in magenta in the above family alignment and are shown on the structure of T0473. Due to their conservation, it was hypothesized that they might be part of a metal or some other ligand - binding site. First models for T0473: Gaussian kernel density estimation for GDT-TS scores of the first server models, plotted at various bandwidths (=standard deviations). The GDT-TS scores are shown as a spectrum along the horizontal axis: each bar represents first server model. The bars are colored green, gray and black for top 10, bottom 25% and the rest of servers. The family of curves with varying bandwidth is shown. Bandwidth varies from 0.3 to 8.2 GDT-TS % units with a step of 0.1, which corresponds to the color ramp from magenta through blue to cyan. Thicker curves: red, yellow-framed brown and black, correspond to bandwidths 1, 2 and 4 respectively.